by Stephen W. Bullington, Ph.D.
A large fly belonging to the Laphriini, Laphria champlainii (Walton). Fly is about the size of a large bumble bee. This is a series of web pages devoted to a group of robber flies, comprising the tribe Laphriini. 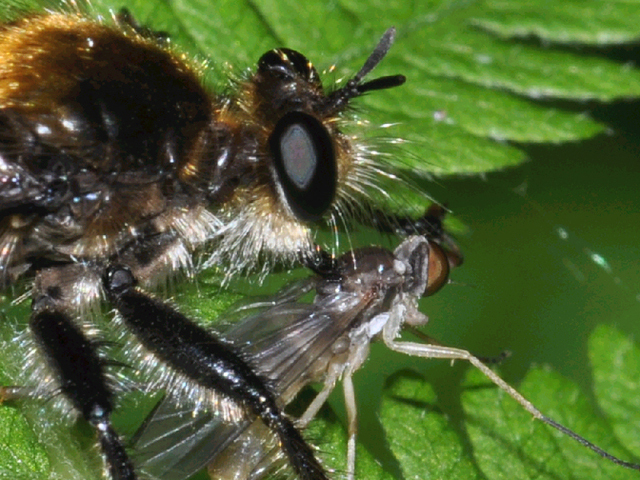 The robber flies in this tribe have a more-or-less cosmopolitan distribution. But for political and practical reasons the pages here will cover only those species found in continental North America north of Mexico. 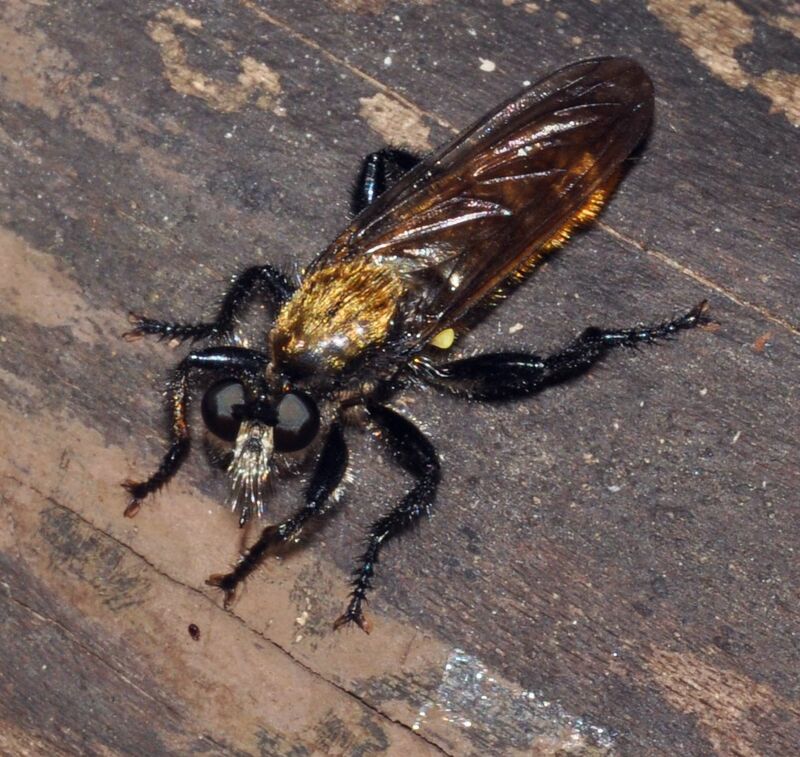 Four subfamilies of robber flies are present within the geographic confines of the United States and Canada--the Leptogastrinae, the Dasypogoninae, the Laphriinae, and the Asilinae. In this listing the Asilinae are usually placed last--indicating that they are furthest removed from a common ancestor. In most respects, however, the Laphriinae are by far the more modified animals. But they obviously have much in common with the more primitive Dasypogoninae, so much so in fact that in an alternate scheme of classification it would be possible to consider them as several tribes under that heading. So the two subfamilies are grouped together, and ranked according to the condition of their most primitive member. Right wing of a laphriine robber fly, dorsal view. Marginal and 4th posterior cells are closed, that is, bordered on all sides by veins, instead of one side being bordered by the wing margin. All robber flies in the subfamily Laphriinae have the marginal cell and the fourth posterior cell of the wing closed. This character alone will distinguish Laphriines, including the flies which we are considering here, from Leptogastrinae and most Dasypogoninae. 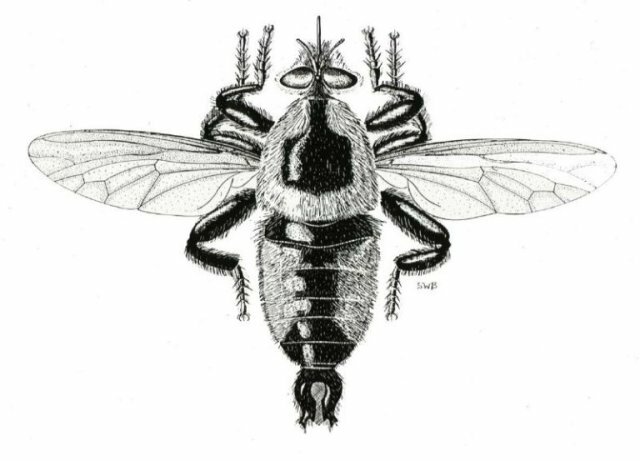 Flies in the subfamily Asilinae, however, sport wings constructed similar to those of Laphriines. But most asilines have the third segment of the antenna with a bristle-like structure called an arista. This arista is very different from the more specialized Laphriine antennae, where with one or two exceptions the segment ends in a peculiarly constructed pit. Head of a laphriine robber fly, side view. As you can see robber flies have huge eyes, which they use to spot flying prey. 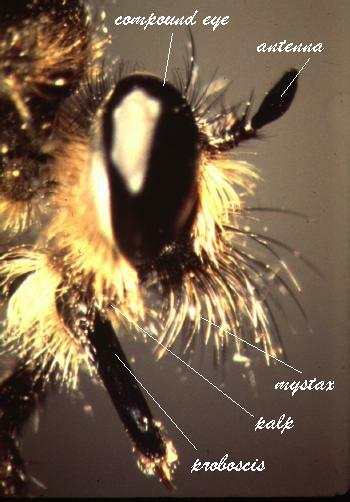 The mystax or "moustache" helps protect the head of the fly when it encounters the prey in the air. Notice the three-segmented antenna without an arista. This is quite specialized. The Laphriini can be distinguished taxonomically from the other tribes within the Laphriinae by the possession of normal--that is, hot-dog shaped--palpi and a proboscis that is flattened from side-to-side like a paper knife. The first of these is of course a plesiomorphic character, and therefore cannot be used as a phylogenetic criterion. But the second is very highly specialized. This characterization is somewhat more strict than is usually admitted. For example, Hull (1962) includes the odd-ball genera Dasylechia Williston and Orthogonis Hermann as Laphriini. Yet these two genera are both more primitive and older by far than any Laphriini, and have nothing to do with the group. For example, both have short, rounded probosci. And Dasylechia has very primitive male genitalia (with for example a large shield-like eighth tergite), in addition to some extremely specialized traits (such as large, barrel-shaped palpi). So the Laphriini as defined here includes the following genera in North America north of Mexico: Laphria Meigen s. str., Choerades Walker, Lampria Macquart, and two new genera. The genus Bombomima Enderlein is considered as a synonym of Laphria s. str. Unidentified larva of a laphriine robber fly. Head end is on the right. The larvae of all Laphriini are believed to tunnel through decaying wood. The few that are known look somewhat like the "fly version" of a wood boring beetle. These larvae are presumed to be predacious, although this has never been proven. My guess is that the larvae feed on the fungal hyphae that are decomposing the wood. Pupal exuvia of an unidentified laphriine robber fly, ex situ. Head end is on the right. Note flexible abdomen and cephalic spines. The pupae of Laphriini are of a typical brachyceran type with a movable abdomen and a head that is armed with spines. Just before eclosion these pupae wiggle their way to the exit of the larval tunnels to the outside world. 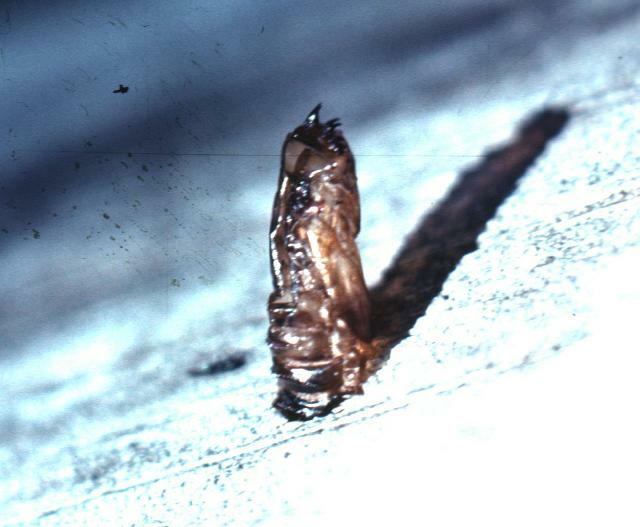 The emerging fly leaves the pupal exuvia protruding from the mouth of the tunnel, as in the photo below. These empty exuviae can often be collected long after the adults have departed. Pupal exuvia of an unidentified laphriine robber fly, in situ. Exuvia is projecting from tunnel of small carpenter bee on bleached surface of log. Photo Dr. R. J. Lavigne and S. W. Bullington. The adults are "still hunters," that is, they hunt from a perch, and fly out to catch passing insects. 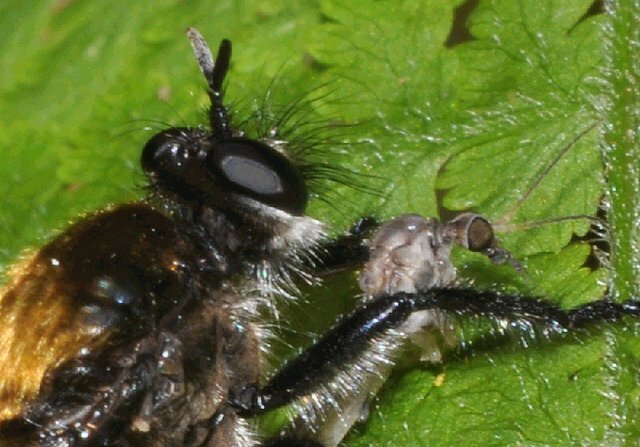 The compound eyes are somewhat flattened anteriorly (although not so much so as in some other robber flies), and the head is perched on a very mobile neck. When hunting the adult tries to follow the prey by turning its head so that the front surface of the eyes is at right angles to the line of sight. In cases where turning the head (the eyes are fixed) is not enough to accomplish this, the fly will twist and extend its body to augment the head movement. Thus while hunting these flies are very animated, making the phrase "still hunting" somewhat of a misnomer. Flies rarely stay at one perch for more than a few seconds if they are not in bright sunlight. An hunting individual of what is currently known as Laphria sericea (Say) (the species will eventually be transferred to one of the two new genera), taking a gander at the photographer. Note the extremely mobile head. Incidently, although mobile, the heads of robber flies are firmly secured to the body, and almost never fall off in pinned specimens. Clearfield Co., PA, July 05, 2011. Photo S. W. Bullington. 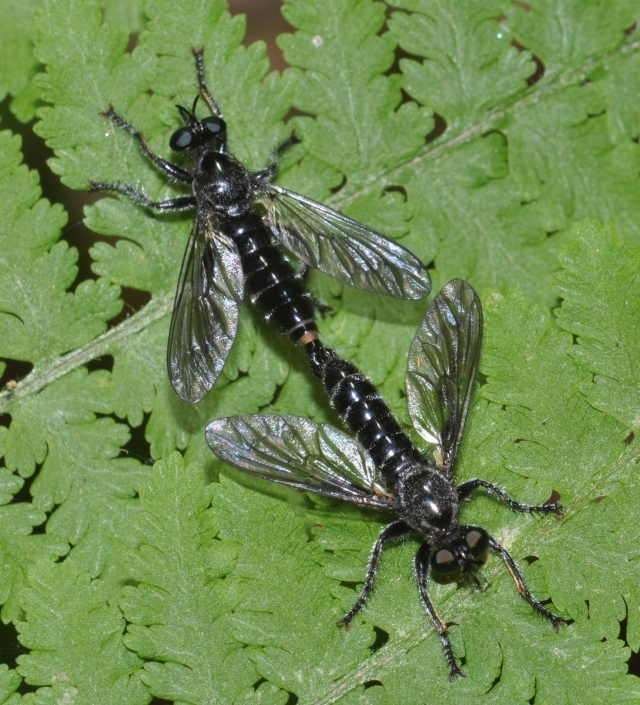 Flying prey are caught using the stout, heavily-bristled legs, injected with a poison and digestive enzymes, and then sucked dry with the stiletto-like mouthparts. This is no exaggeration. In the two photos just below I have taken shots of the same species just figured, feeding on small flies it has captured. In both cases the head of the robber fly, the prey item, and especially the point of insertion of the proboscis is in tolerable focus. Both the crane fly and snipe fly have the proboscis of the laphriine inserted on the rear dorsum of the thorax, between the mesonotum (the top of the second thoracic segment from the front) and the scutellum (the projecting "shelf" at the back end of the thorax). Both shots were taken on July 05, 2011 in Clearfield Co., PA. The crane fly is the prey item in the top photo. What a way to go! As far as is known there is no courtship; the male merely pounces upon the female in the air, much as if he planned to eat her. Coupling is "tail-to-tail," that is, the male and female terminalia are interlocked, and their heads face in opposite directions. Strangely enough, they can fly fairly well while hooked together this way. This method of coupling and flying in tandem has important correlates in various structures of both the male and female terminalia. Mated pair of Laphria fernaldi (Back). Male is on the right. The bow-shaped extensions projecting to each side of the hypopygium are the mesal processes. 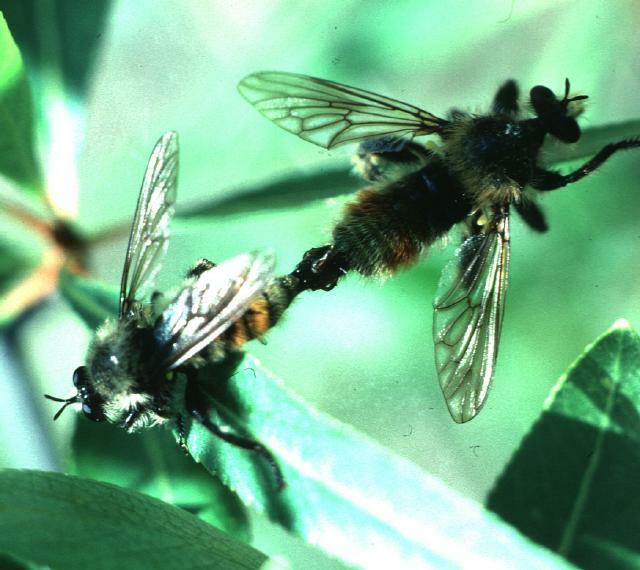 This position, which the flies retain while flying, is known as "tail-to-tail." The male terminalia are permanently rotate 180 degrees in all Laphriini. Photo Dr. R. J. Lavigne and S. W. Bullington. Mated pair of what is now known as Laphria winnemana (McAtee) (the species will eventually be transferred to the other of the two new genera) . The genus to which this and like species will be transferred has considerable specializations of the terminalia in both sexes for keeping the coupled pair rigid while flying, presumably to increase maneuverability. Male is the lower of the two flies. Photo S. W. Bullington. Clearfield Co., PA, July 05, 2011. Both sexes live about two to four weeks as an adult. The page will cover the five valid genera listed at the end of the taxonomy section. Although I have not worked specifically on Lampria, I have included it because 1) it is more closely related to Choerades than Laphria is itself, 2) there are only a few species in North America north of Mexico, and 3) by including it I will have covered all the genera in the Laphriini in North America north of Mexico. For now I have only posted the information on Laphria s. str. The pages for Choerades are well on their way to being complete, and should be posted in a few months, if not sooner. They contain a great deal more information about each species than the pages I have posted on Laphria s. str., and amount to a monograph of everything known about the genus in North America. The pages for the two new genera will follow those for Choerades (and publication of the names elsewhere). These will also amount to monographs. The material on Lampria will be posted last. This site is owned by Stephen W. Bullington. I last updated the pages on 3 February 2016. All the original material presented here is protected by copyright.